Tzofnat Pane'ach, homily on Shemot, by R. Yaakov Yosef HaKohen Katz Rabbi of Polonne, author of Toldot Yaakov Yosef. Korets: [Tzvi Hirsh Margolies and son-in-law Shmuel son of Yissachar Ber, 1782]. First edition. This is the author's third book, following Toldot Yaakov Yosef and Ben Porat Yosef. In this book, like in the previous ones, the author quotes extensively from the teachings of his prime teacher R. Yisrael Baal Shem Tov. The Chida in Shem HaGedolim writes about this book: "Tzofnat Pane'ach, innovative novellae… homily on the Torah portions of Shemot, delightful homily according to the 'Pardes' approaches of interpretation. Authored by R. Yaakov Yosef, who often cited the introductions of his prominent teacher, R. Yisrael Baal Shem Tov. And we know that this rabbi already published Toldot Yaakov Yosef, and it is widely acclaimed. And there (in Tzofnat Pane'ach), it says that he authored Ben Porat Yosef. 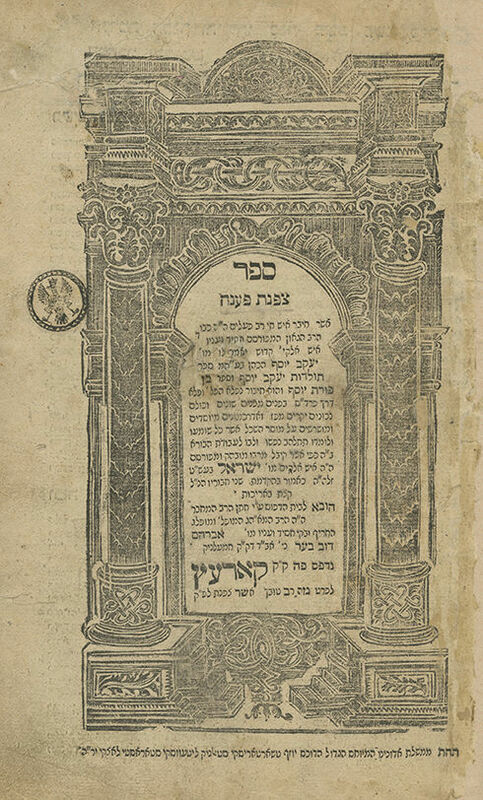 And Tzofnat Pane'ach was printed in Korets in 1782" (Maarechet Sefarim, Tzadi). From the words of the Chida, it appears that of all the books of the Toldot Yaakov Yosef, only this one was before him. , 95 leaves. 29.5 cm. Condition varies, most leaves in good-fair condition. Stains. A few dampstains. Worming to a few leaves. Tears to title page and two subsequent leaves, affecting text and border, repaired. Damage to several leaves, slightly affecting text. A few leaves trimmed, affecting headings. Extensive worming to final leaf, affecting text, professionally restored. Censorship stamp on title page. New, elegant leather binding.